If you’ve ever been confused or overwhelmed when considering PCOS supplements, then you’re not the only one. Given the misleading truth claims presented all over the internet, the easiest options are to either just give-up or to “give it a try” without knowing if “it” will actually help. While wasting money is frustrating, doing your health more harm than good is worse. As someone with no links, ties, or affiliations to the supplements industry, my Beat PCOS Supplements Guide provides a unique review of the science behind supplements. The 10 most well proven supplements for different PCOS related symptoms. A description of supplements that are often promoted as being good for PCOS but are actually best avoided. Nutrient inadequacies of relevance to women with PCOS including those caused by the most common PCOS medications. Essential tests you should do especially if you’re taking birth control or metformin, or you’re trying to conceive. Risks relating to an unregulated supplements industry and brands you can trust. Quick look-up tables for an additional 150+ supplements that I have rated by strength of effect and their level of scientific evidence. A download of all 900+ scientific references used to develop this resource. 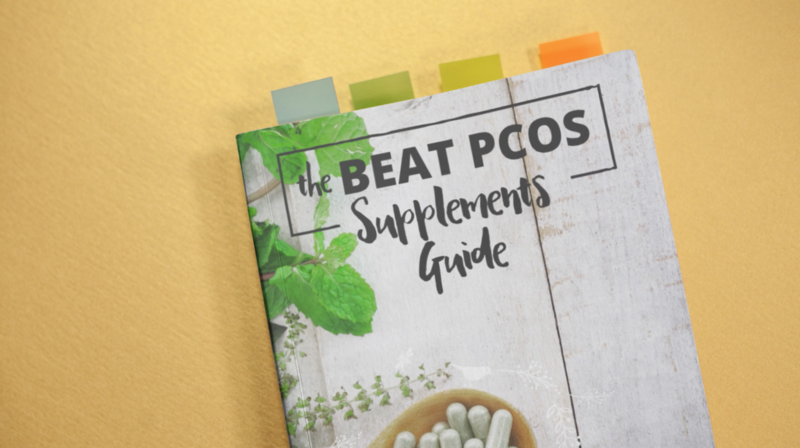 As someone whose only interest is providing the best information possible, this beautifully designed ebook is an essential resource for anyone considering nutritional supplements as part of their PCOS friendly lifestyle.